While students often watch zombie flicks to procrastinate, in some courses, a detailed knowledge of eating brains is practically compulsory. The University of Baltimore offer a class on zombies as part of its "English 333" course, with students taught to create storyboards and write horror movie scripts. In another take on the zombie apocalypse, Michigan State University offer a seven week summer course called “Surviving the Coming Zombie Apocalypse: Catastrophes & Human Behaviour". 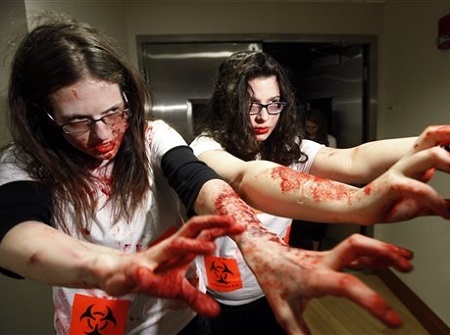 Analysing how humans behave during catastrophes, this course covers historical events before moving onto a theoretical zombie invasion. Just as zombie movies inspire zombie studies, other elements of popular culture also influence education. The University of South Carolina offer a course on Lady Gaga, where students are able to "engage in sound and substantiated scholarly thinking" on Gaga's meteoric rise to fame. Beyonce has also inspired her own university course, with "Politicizing Beyonce" available through New Jersey's Rutgers University. However, with students having to compare Beyonce to the work of authors and activists like Alice Walker and Sojourner Truth, this course may be tougher than you think. Everyone's favourite TV family The Simpsons also have their own dedicated university class, in the philosophy department nonetheless. The University of California at Berkeley examine the hit cartoon series through the eyes of Nietzsche, Plato, and many of the other minds who have helped shape western thought over the centuries. Described as a "fairly rigorous" philosophical course, students have to battle with weighty questions such as "Can Nietzsche’s rejection of traditional morality justify Bart’s bad behaviour?" Strange university courses aren't all about pop culture, however, there are also lots of practical examples. For example, students can study Baking Technology Management at London Southbank University, Brewing and Distilling at Heriot-Watt University, and Surf Science and Technology at Cornwall College. Perhaps the weirdest course of them all, however, is "Underwater Basket Weaving". Offered at Reed College in Portland, Oregon since 1980, this course is so strange it has become an idiom for supposedly easy and/or worthless college or university courses. The University of Arizona also offered a submerged snorkelling basket-weaving course in spring 1998. While they have not entered the world of urban mythology in the same way as underwater basket weaving, other wacky courses around the world include "The Joy of Garbage" at Santa Clara University, the "Elvish Language" at the University of Wisconsin, “How to Win a Beauty Pageant: Race, Gender, Culture, and U.S. National Identity” at Oberlin College, "Street Fighting Mathematics" at MIT, "UFOs in American Society" at Temple University, "The Unbearable Whiteness of Barbie" at Occidental College, and "The Science of Superheroes" at the University of California Irvine.